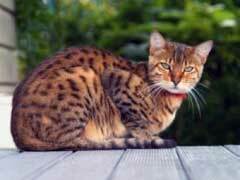 Bengal cat breeders have created a cross between domestic cats and small Asian Leopard cats. Bengal cats are medium to large in size. Once the two breeds of cats have successfully cross bred, Bengal cat breeders started crossing the Bengal cats with one another. Four or five generations later, these cats are eligible for competition. The breed is recognized by worldwide cat associations. Bengal cats are known for their exotic markings. Savannah cats are the result of a cross between a domestic cat (Siamese) and a large eared, medium sized wild African cat known as a serval. The first cat that was a result of this breeding was named Savannah, hence the name of the entire breed. The Savannah and the Bengal cat personality are similar. These cats are very smart and playful. They can even tolerate walking on a leash! Unlike domestic cats, these cats have no aversion to water. In fact, some are known to shower with their owners! If you are searching for Bengal cats for sale, you should do a little homework before you buy. Good Bengal cat breeders will be happy to talk with you about their cattery. Since these cats to have a wild side to them, you will want assurances that the kittens are handled and interact with humans on a daily basis in order to minimize the likelihood of cat aggression towards people.